A breast collar is a piece of tack that goes on the front of a saddle to help keep the saddle in place. Below are Western breast collars for horses for sale on Amazon and eBay. 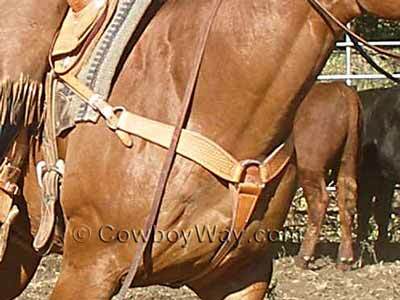 While styles of Western breast collars vary, they share the primary job keeping a saddle from sliding too far back. They can also be useful to help keep the saddle from tipping side-to-side. Breast collars are considered by many horse people to be an essential piece of equipment, and are used in virtually every type and style of riding in both English and Western riding disciplines. You'll find an excellent selection of breast collars below that are offered for sale alone, or with accessories such as headstalls and reins. The breast collars are mostly Western styles, but there are also a few English styles. Below: A Western breast collar made of heavy leather. In the worlds of English and Western riding, there are different designs of breast collars. 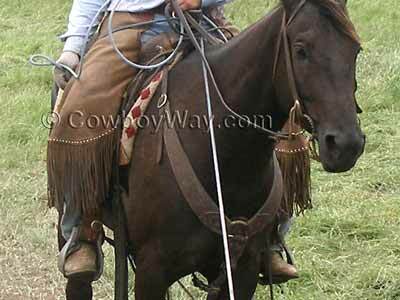 Below are just two styles commonly used when riding with Western tack. The first style of breast collar below is commonly used in a wide variety of Western riding activities, including trail riding, barrel racing, roping, and many more. This classic style of breast collar buckles to the D-ring on one side of the saddle, goes across the front of the horse, then buckles to the D-ring on the other side. 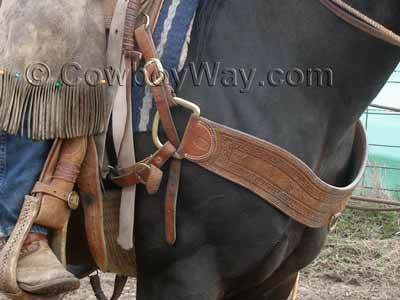 It also has a strap that goes down between the horse's front legs and snaps to a ring on the front cinch. Below: A common style of Western breast collar. Another popular style of breast collar used by Western riders is shown below. This style is often called a "pulling" breast collar. They are particularly popular among ropers. Instead of buckling around the D-rings of the saddle like the breast collar above, this style buckles around the pommel (also called the "fork" or the "swells") of the saddle. Below: A style of Western breast collar commonly called a pulling collar. If you find a breast collar you like but you're not ready to purchase it right away, you can always add it to your shopping cart so it will be easy to find later. In most cases, Amazon.com will keep track of your breast, and anything else in your shopping cart, for 90 days. In the meantime, if you want to check out with other items, click "Save for later" to move the breast collar to a separate, but still easy-to-find list beneath your shopping cart.